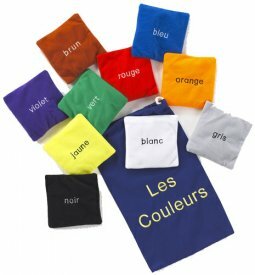 These high-quality bean bags will help children to learn and revise colours in French. Each bean bag is a different colour and has its colour stitched in words in French onto one side. My KS2 pupils love hurling these around the room to one another and making their friends call out the colours in French to score a point, drop the bag and lose a point. !! More colours than I expected! Well made too. A good product, easy to use in class. ...would be even better if there was a pink one! Good for interactive learning, the kids loved them, good value for money.